Background: Recently, we have reported that Fisetin, a natural flavonol, is able to regress Aflatoxin- B1 (AFB1) induced hepatocellular carcinoma (HCC) by suppressing reactive oxygen species (ROS) led proinflammatory factors in rats. In the current study, we aimed to delineate whether Fisetin does so by modulating the cell growth promoting signaling cascade in HCC. The reciprocal interplay of 3-phosphoinositol kinase (PI3K) vs phosphatase and tensin homologue deleted on chromosome 10 (PTEN) displays Akt, a protein kinase B, to get phosphorylated at Thr308 by a 3-phosphoinositol dependent kinase 1 (PDK1). This commits cells of neoplastic niche to undergo rapid proliferation by p-Aktthr308 dependent phosphorylation of glycogen synthase kinase 3β (GSK3β) at Ser 9 position. Method: In this study, the effect of in vivo treatment of 20 mg/kg b.w. Fisetin on relative profile of all these factors were studied in the liver from the HCC rats induced by two doses of 1mg/kg b.w. AFB1 i.p. Result: As compared to the untreated HCC liver, liver from Fisetin treated HCC group rats showed a significant decline in the activity and level of p-Aktthr308 which was consistent with a similar decline in PDK1 level. Concordantly, the level of p-GSK3βSer 9 was also found to be declined significantly in those Fisetin-treated HCC livers. Conclusion: A concomitant decline in immunohistochemically detected number of the proliferating cell nuclear antigen (PCNA), a cell proliferation marker, in the HCC liver, further confirmed anti-cell proliferative role of Fisetin during HCC growth in vivo. 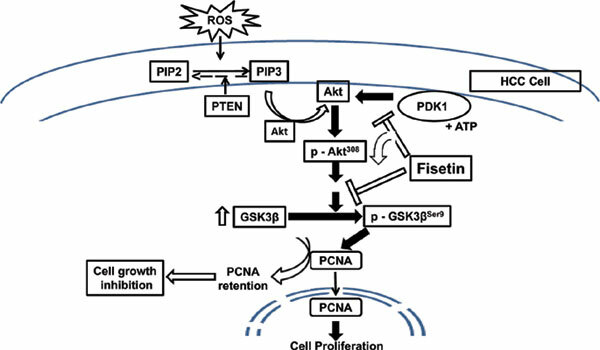 These findings suggest that Fisetin is able to suppress Akt dependent cell growth signaling mechanisms in HCC mainly by down regulating PDK1 dependent Akt phosphorylation. Hepatocellular carcinoma (HCC), AflatoxinB1 (AFB1), pAktThr308, PDK1, p-GSK3βSer 9, Fisetin.